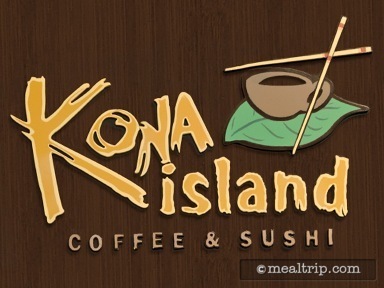 Kona Island is essentially a coffee and pastry bar in the morning, and a sushi and sashimi bar from noon until closing. Needless to say, your experience will vary greatly depending on what time you get there. For lunch and dinner, a modified version of the Kona Cafe’s menu is available. From a beverage standpoint, you can get a Kona Blend Press-Pot of Coffee here in the morning, along with several “coffee bar” standards like lattes and such. Once the breakfast period is over various forms of sake, wine, and beer are available. The small stand-alone bar area is located on the second floor of the Polynesian Resort (the same level that the monorails are on), and is very close to the Kona Cafe. The atmosphere is a little like being in the middle of an airport concourse and the seating arrangement does not lend itself to “lounging” around.